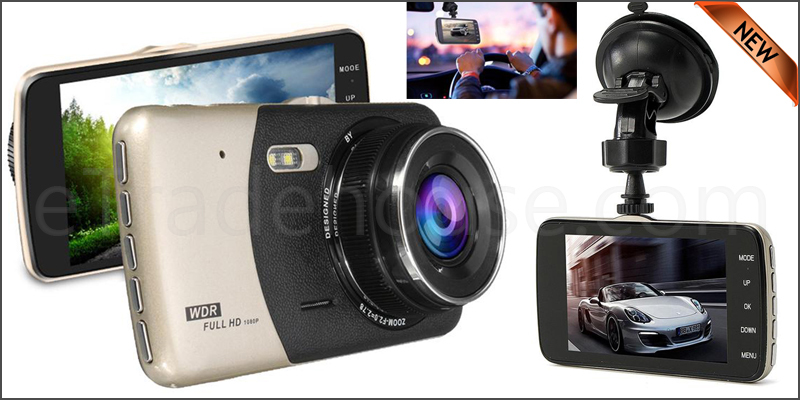 · Rear view mirror + front camera DVR + rearview camera with Power Cable (for camera) which can be set anywhere in the car. · Dual cameras record at the same time &shown in "Picture in Picture" mode. · 170° wide angle lens, can record in moreangles. · After opening the motion detection, it willrecord automatically if there is anyone entering the picture. The function isnormally used to monitor parking. · When the memory card is full willautomatically overwrite the oldest video began circulating recording to ensurethat the memory card is the latest of the latest movie, you do not have toworry about the memory card is full of problems. · G-sensor, Built-in G-sensor, when caraccident happens, automatically saved and will not delete. · Fits easily over your stock vehicle'sexisting mirror. · 1x Suction Cup Bracket.